Havenbestuur Zeebrugge / Pierre Vandammehuis Isabellaan, 1 - 8380 Zeebrugge GPS: N51°33472_ E 3°21946. 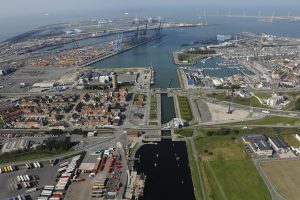 The Port of Zeebrugge and its idyllic hinterland. With the Brexit conundrum raging on both sides of the Channel, nothing more timely than a visit of the Port of Zeebruges, Belgium’s most important gateway for traffic to and from the UK. With the outcome of Brexit negociations still unclear the port is indeed in the process of preparing itself to give as much as possible an adequate answer to the expected consequences on existing trade flows in order to remain a hub of excellence. We will be welcomed by the Port Authorities in the Pierre Van Damme Havenhuis where we will get coffee and an introduction on the importance of the Port and how Brexit may have an impact on current and future trade flows. Our visit will continue by a guided bus tour of the port, which will take us to the Pierre Van Damme Lock, one of the largest locks in the world, the gas terminal, the turbine park, while at the same time admiring the container ships and facilities, and perhaps also cruise ships and dredging vessels. Following our visit to the port, we will head to the “Hof Ter Doest” in Lissewege for our Annual General Meeting and lunch. The restaurant is situated on the location of a 12th century Cistercian Abbey. In the afternoon, guides will take us to the remaining commanding gothic abbey barn, completely restored in 2000, and to the dovecote and monumental gatehouse which also withstood the ravages of time brilliantly. We will discover the village of Lissewege, in early times an important place of pilgrimage, and now famous for its white painted polder houses lovely situated on both sides of an idyllic canal. We will also admire the beautiful church of Our Lady Visitation, which is a textbook example of the coastal gothic style. The works of local artists will also call our attention. Lunch: ”Hof Ter Doest” Ter Doeststraat, 4 – 8380 Lissewege. Two courses, drink and coffee. For vegetarians meals please indicate at registration. If you have registered and paid fort his event, let the organisers know, preferably by e-mail, and they will arrange for more detailed instructions and a map.